It's summertime! 4 pounds of Steamers are here. 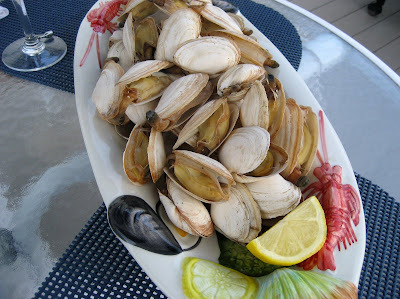 or "Steamers" as we New Englanders call them! A great starter dish or as the only dish. 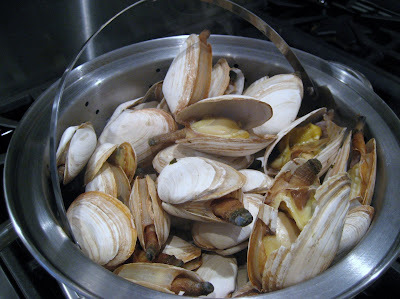 Nothing speaks summer to me more than a big bucket of steamers with delicious broth and drawn butter to dip the clams in. This has to be one of the easiest, quickest and best tasting dishes you can make! The secret ingredient is using a bottle of beer as part of the liquid to steam the clams. It makes the most delicious broth and you can't help but want to sip every last drop. Use any kind of beer, you can't go wrong. 1. Place the steamers in a large colander and run cold water, shaking them to release any sand that may be trapped. When the water runs clear, you know they are cleaned. 2. In a large pot (with a built in strainer if you have one, otherwise any large pot with a lid will do), add the beer and enough water to come just to the bottom of the double pot strainer or 2 inches up the side of the single pot (usually about 1-2 cups of water). 3. Place the steamers in the pot and cover. Cook on a medium high heat until the liquid comes to a boil and cook for 10 minutes until the clams all open up and are not transparent. It doesn't take long once they open up. 4. Serve with a bowl of the clam broth and melted butter. Steamed clams are ready in about 10 minutes.